When I don’t know what to do with myself, when I am anxious and when I am incapable of understanding why I am feeling uneasy with everyone around me, I leave the house with my camera at hand. Most of the time I am not sure what I am seeking, but it’s not important. The single movement of just opening the door, stepping outside with the idea of maybe capturing a glimpse of the same life I see with my bare eyes behind my camera and make it look different it’s worth the dwelling. Sometimes I come home with nothing. I come home uninspired and pissed off for the time wasted wondering for hours without proofs of my traveling. Other times I surprise myself. The most uninteresting shot becomes the opening photo of a new project I was not even aware I had in mind. Yesterday was one of those inspiring and surprising days. I wasn’t looking for anything, but some fun with my little sister exploring the center of Rome. 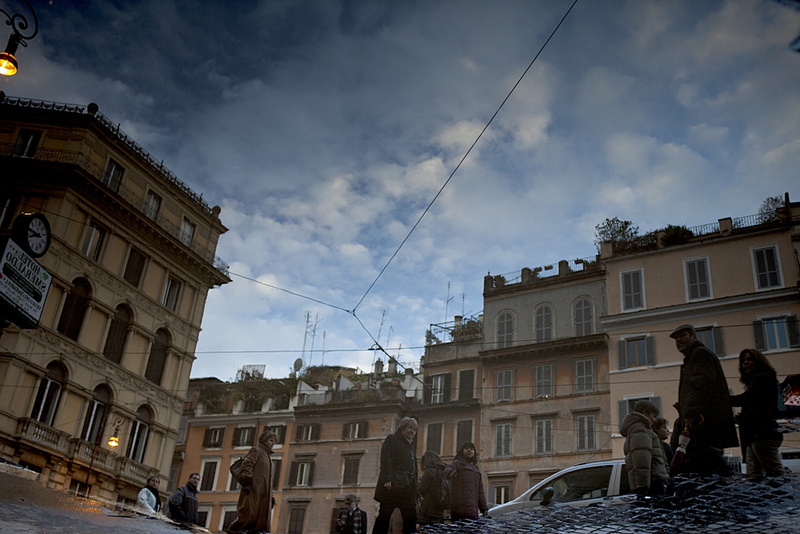 Few hours later I got lost behind the camera photographing a puddle of water on the sidewalk near the pantheon.